This is adorable boy is Captain Trout. He is an indoor/outdoor cat. While playing outside recently Captain Trout was hit by a car. His owner rushed him in and upon examination, the doctor found some minor external abrasions as well as a broken jaw (see x-ray). His lower jaw, or mandible, was broken at the symphysis or the part that connects the front of the right and left lower jawbones. 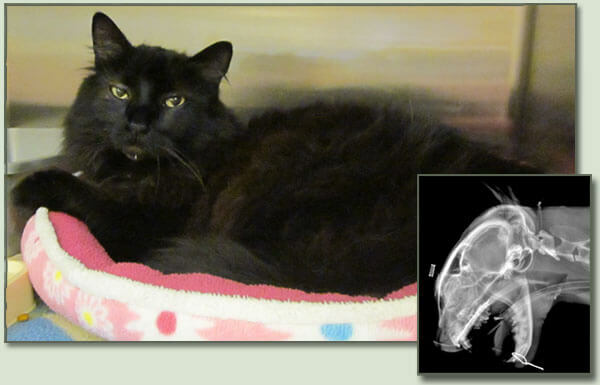 This is a fairly common injury in cats who suffer facial trauma. Captain Trout was stabilized and after anesthesia and x-rays were taken to confirm no other problems his jaw was temporarily wired in place and within 24 hours he was eating again and back to his usual purring self. The wire will be removed after 8 weeks and he should be back to his normal self. Due to his bravery in this ordeal, Captain Trout is this month’s Pet of the Month.